All of middle class and quite possibly every other class is waiting eagerly for tomorrow’s release – Middle Class Abbayi (MCA) starring Nani, Sai Pallavi and Bhoomika among others. 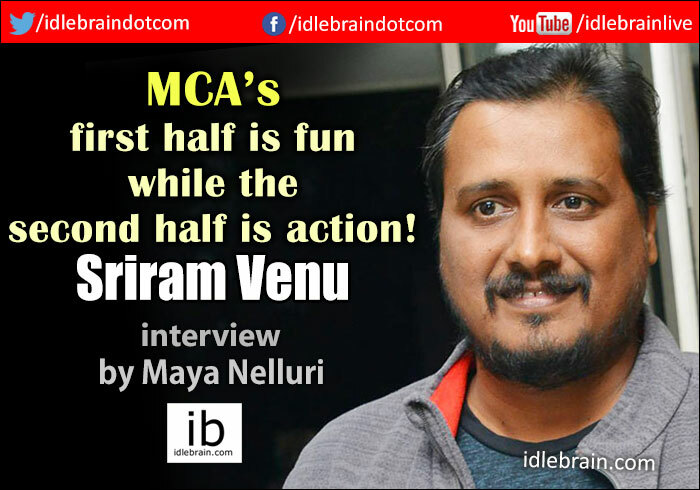 The film’s director Sriram Venu opens up about the process he had to go through to bring MCA to audiences and also his struggle after his debut Oh My Friend. Read on. Tomorrow is MCA’s release; what are you feeling? I have mixed feelings. *Smiles* I’m anxious, excited, a little afraid. But overall I’m looking forward to the audience’s reaction. I feel that they will enjoy it because it will be middle class boys, girls, and audience watching so it should connect to them. What can we expect from MCA? It is a fun-filled, action film. As you saw in the trailer, the first half is fun while the second half is action. All I can say is you will not be disappointed with both aspects. Did you write MCA with Nani in mind? When I wrote it I had Nani in mind but when I was pitching it to Nani, he had a lot of projects lined up so I also approached other heroes. Even they had date issues so when we went back to Nani, he said that he really likes the story and if we can wait then he’ll do it. I felt strongly that I wanted to wait for him and so we did. How was working with Nani? I have to say that Nani is the reason this project got going. Regardless of my efforts, MCA got a kick start because he agreed to do the film. As for working with him, we all know that Nani thinks as much as a director for a film. We shot in Warrangal, in natural locations so it was very difficult and irritating to control the crowds. There were times that I lost my cool but he was always cool. In one particular episode we were shooting at the Warrangal railway station and we had to stop shooting for two to three hours because of the crowd. I thought we’ll shoot in RFC because it was really becoming a hassle but Nani pushed me to continue with the natural setting. He wanted to keep going there. When we picked her Fida did not release, it was under shoot. Although you can tell that this film is not an out and out love story she has a meaty role and she completely did justice to her character. What was one thing that really stood out while working with Bhoomika? She plays Nani’s sister in-law in the film so on location she bonded with everyone like they were family. Of course, we all know that she is a very good performer and subtle with her emoting but I think something that isn’t discussed as much is her punctuality. She is the most punctual and dedicated artist on the set. Everyone is late at times but even if she is late by five or ten minutes, she makes it a point to inform and will definitely be on set in the time. I don’t think anyone else lets you know if they are five – ten minutes late. It is a very rare quality. Your technicians are incredibly experienced, how was your experience with them? Our DOP Sameer Reddy comes with a lot of experience while I’m just two films old. That experience was very useful for me. Especially when we shot in natural locations, his coolness held the set together. Emotionally also he helped me a lot. Whenever I had an issue on the location, he helped out a lot. And then we have DSP. I was very lucky to get technicians like them. DSP was also a major asset for me. He gives wonderful tunes and once you watch the film you’ll see that he gave a great RR for this film. And apart from his work, interacting with him is always an energy booster. As I was going through this, my confidence was a little low due to previous work issues. But when I went and narrated to him, the kind of energy and confidence he gave me really drove me. He doesn’t need to do that. He can just listen and give tunes and go but he really took the time to interact and boost me. He is one of the most beautiful human beings I met during this cinema making process. Tell us about the rest of your team. For any project to start, we have to start with a dot on the blank page. That turns into everything else. From the time I put a dot on the sheet for MCA, my younger brother Tiru (Tirupati Mamidala) was there with me and he did the dialogues. My other two associate directors Bandi Nagaraju and Suresh Botla were my strength. Everyone else involved in the film were already very successful but the four of us were still making a name. As you know we are only as good as our last film in this industry and every Friday decides our fate here. If your last Friday went well, then you will be received well, if not, you will have to go through the struggle. What I mean to say is that these three individuals really helped me focus on the future and are the main reasons I came through this project successfully. Apart from them, there is my art department, Ramanjuneya garu, editor Praveen Pudi; all the technicians gave me full support. How is your relationship with your producer Dil Raju? Dil Raju garu is more than a producer to me. To everyone else he might be just a producer but I’ve worked only with him since the beginning of my journey in films. I was an AD here and even the other films which I was working on as a director were through him. He gave me the feeling that someone is there for me. He is my guide, philosopher; he’s like a brother or father figure to me. You’ve had a long gap between your first release and second. Can you tell us why? Actually after Oh My Friend didn’t do well it was not the best time. But that wasn’t really the reason for the delay because there are many times that one comes back after a failure. There were two films that almost took off but got cancelled. For each film, there is a lot of work that goes into it even before the movie goes on set. Each film took one and a half years before we reached the stage where we were about to shoot. In the audience’s perspective there was a big gap between my first film and now but I was never actually free. I had to write, pitch it to the hero/ producer, do preproduction, and this process was repeated twice by me before the projects were shelved. Then I started the process again for MCA. On the plus side, even after that gap, I’m glad that I could come back with MCA. How did you keep motivated through those years? My first film to my second is a very personal and long journey. I did not struggle at all for my first film. I was working with Raju garu then. Once I pitched the idea to Raju garu and narrated the script to Siddharth it just happened. But my second film took so long. Even during that time, I never lost my motivation because every good film motivated me. It is not just the all time greats like Mani Ratnam or RGV but even recent successes like Tharun Bhasker and Sandeep Vanga are inspirations to me. I loved the way Pelli Choopulu was written and the way Arjun Reddy was directed. Every great film maker and movie kept me going because for me the only path was films. I’m a graduate but I was never inclined towards academics. I don’t know anything except for films so I have to be here. I either have to direct or write for others or help with dialogues; I’m prepared to do everything here. I even worked as an AD for a couple of films before becoming a director. Even if someday I will be creatively drained, and I stand at a crossroads in my life, I will still stay in films. If I’m not making movies on screen, I’ll make them on paper or in my mind. What role did media play for you during this time? Have to thank the press/ media. Honestly! Whether it be electronic, television or print, they are the people who kept me alive even during my lull. They updated about me every time. Whatever happened they kept me in the audience’s eyes, whether it was good or bad. I feel very positive about it. They kept me relevant and kept me going. What role did your family play in your career? Apart from good films, during my low periods I sustained my motivation because of my family. As we all have day to day expenses, it is difficult to keep going without working. Writing is easy but materialising that is very difficult. Emotionally you have to sustain yourself and also keep your family running. There is a lot of balancing we have to do with finances. My family, mother, brother, sister, sister in-law, brother in-law and most importantly my wife – they all supported me. My wife ran the house with any amount regardless of what I earned. Whether it was 20,000 or one lakh that I got home, she managed our home in that. I also have two children, one daughter and one son. They are my stress busters in my low periods. What future projects will you be working on?